FILE - North Korean leader Kim Jong Un watches the launch of a Hwasong-12 missile in this undated photo released by North Korea's Korean Central News Agency, Sept. 16, 2017. 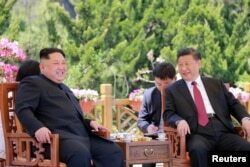 Pyongyang’s interest in taking “incremental” steps and Washington’s opposition to this “phased” approach toward denuclearization is emerging as differences that need to be resolved for a successful summit between President Donald Trump and North Korean leader Kim Jong Un, according to analysts. 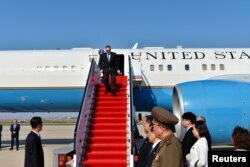 U.S. Secretary of State Mike Pompeo returned Wednesday from his visit to Pyongyang after a meeting with North Korean leader Kim Jong Un that was planned to draw up a framework for denuclearization talks for the upcoming summit. Trump on Wednesday tweeted that Pompeo’s latest Pyongyang talks went well. During a Cabinet meeting, Trump said the date and location will be announced in three days and ruled out the Demilitarized Zone between North and South Korea, silencing speculation about one possible location of the meeting. U.S. media were reporting late Wednesday that Singapore seemed the likely site for the meeting. It is unclear if during his meeting with Kim, Pompeo narrowed the gap over how to denuclearize the Korean Peninsula. A U.S. official who accompanied Pompeo and participated in the talks in Pyongyang said, “We also agreed to meet again in person to finalize the details,” indicating more details need to be hammered out with the North ahead of the Trump-Kim summit. While making a brief refueling stop on Yokota Air Base in Japan en route to Pyongyang, Pompeo said the U.S. is “not going to do this in small increments, where the world is essentially coerced into relieving economic pressure” on North Korea, referring to the process of denuclearization. Kim, during his meeting with Chinese President Xi Jinping earlier this week, said North Korea and the U.S. should take “phased and synchronous measures” to achieve denuclearization. Robert Manning, a senior fellow at the Atlantic Council, believes a denuclearization process could take several years, but it could also be done in weeks. Ken Gause, director at the International Affairs Group at the Center for Naval Analysis, suggests Washington and Pyongyang could have an agreement on denuclearization drawn up ahead of the summit. He speculated a potential promise on denuclearization that Kim could have made might include “some concessions by North Korea on dismantling [a] certain part of its [nuclear weapons] program” and ballistic missiles program. “But I think that’s as much as North Korea would give up," he added. U.S. Secretary of State Mike Pompeo exits his plane on arrival in Pyongyang, North Korea, May 9, 2018. Gary Samore, a former White House coordinator for arms control and weapons of mass destruction under the Barack Obama administration, thinks the U.S. will most likely give “credible security assurances” in exchange for North Korea’s agreement to denuclearize. The U.S. has not stated what incentives it would give North Korea for giving up its nuclear and ballistic missiles programs, other than to say that Trump’s “maximum pressure” sanctions will not be relaxed until it takes concrete steps to denuclearize. During his summit with Japanese Prime Minister Shinzo Abe and Chinese Premier Li Keqiang on Wednesday, South Korean President Moon Jae-in said although North Korea expressed its commitment to denuclearize, the actual steps to achieve the process will be difficult. The leaders of South Korea, Japan and China met in a trilateral summit in Tokyo, creating an added momentum for the anticipated Trump-Kim summit. The three leaders agreed to cooperate on getting North Korea to give up its nuclear weapons.